New York (TADIAS) – In 2009, over 99% of Egypt’s residents had access to electricity, while in Ethiopia, a country of 80 million, less than 18% of the population had access to power. In neighboring Sudan 35% of its roughly 30 million inhabitants received energy generated by the Nile river. In 2011 the annual fresh water withdrawal in Egypt was recorded as 68.30 billion cubic meters. The same year Sudan also took in 37.14 billion cubic meters of fresh water. In comparison, Ethiopia’s withdrawal of fresh water for the same period was a meager 5.56 billion cubic meters. 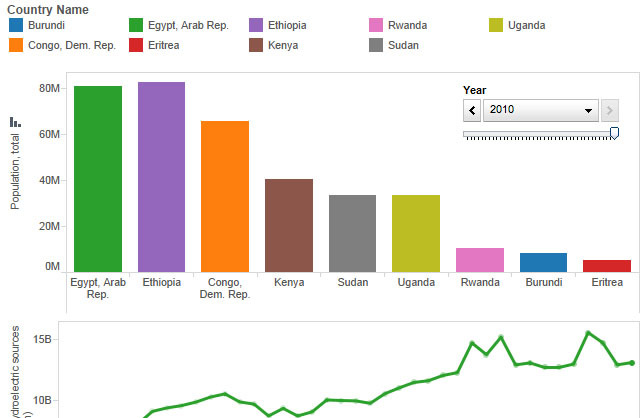 These statistics come from the World Bank’s “World Development Indicators” and are now compiled by a newly launched website that employs data visualization and creative interactive timelines of Ethiopian history and current affairs. Ethiopia and Egypt, next to Nigeria, are both among the top-three most populated countries in Africa. Jomo told Tadias that research driven stories are something he deals with on a daily basis, and he hopes that this would particularly assist journalists in providing a balanced coverage of the rather heated current exchange between the two nations on the Nile matter. “What inspired this project?” we asked Jomo. “Even though I have been meaning to do a data visualization site on the continent and Ethiopia, discovering a similar Ghanaian site really got me off my lazy chair,” Jomo said. You can learn more and add to the information at www.timelineethiopia.com.